Palmilla Golf Club - Cabo Villa Rentals - Vacation Rentals in Los Cabos, Baja California Sur, Mexico. Designed by Jack Nicklaus, this stunning terrain offers a world-class course with seaside vistas. 3 distinct 9 hole courses (Arroyo, Mountain, and Ocean) for all level of play. Course features a wide variety of cactus, trees, and colorful wildflowers. 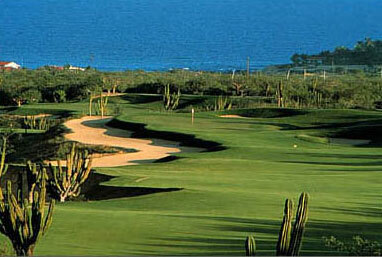 The Palmilla Golf Club, opened in December of 1992, is Latin America's first Jack Nicklaus signature course. Jack Nicklaus was brought in to design his first course in Los Cabos, featuring the front "Arroyo Nine" and back "Mountain Nine." Nicklaus described the design as "
designing desert mountains by the sea." Palmilla offers golfers spectacular views of the Sea of Cortèz from nearly every hole as it winds through centuries old cardon cacti and rugged desert mountain terrain, making each hole a memorable experience for golfers of every skill level. The course is divided into the 3,337-yard Arroyo Nine, the 3,602-yard Mountain Nine and the 3,548-yard Ocean Nine. The five sets of staggered tee boxes ensure golfers, from beginners to professionals, an exciting game. The Ocean Nine layout, featuring a 600' elevation change from holes one to six, takes advantage of the natural desert and mountain terrain, and features challenging directional changes. Several of the holes are within a pitching wedge of the ocean and boast panoramic views of the Sea of Cortéz. Click on map for larger image of Palmilla Golf Course. Cabo Villa Rentals is not responsible for any errors and omissions on this web site. This web site is updated daily.